As always I went to "The Quiet Heart" page of Decision magazine when the latest issue arrived in our mail box today. This month's theme is "Breathed By God" and deals with the divine inspiration of the scripures. "The very God of the universe speaks on every page (of the Bible) into my mind - and your mind. In it God speaks in the 21st century - the very voice of God. By this voice, He speaks with absolute truth and personal force. By this voice, He reveals His all-surpassing beauty. 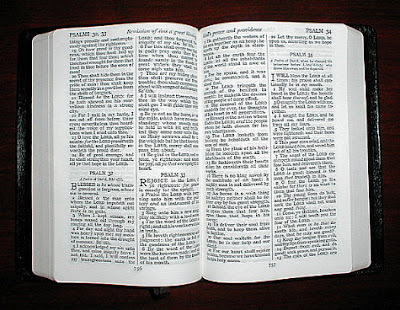 It is a great wonder that God still speaks today through the Bible with greater force and greater glory and greater assurance and greater sweetness and greater hope and greater guidance and greater transforming power and greater Christ-exalting truth than can be heard through any voice in any human soul on the planet." I'll add a loud, hearty AMEN to that! If the truth of Piper's statement permeated our finite beings, wouldn't we take more time to hear God's voice through His inerrant Word? Wouldn't we be more intentional and diligent about spending time with the Book? Father, may I understand the reality that You have spoken clearly and authoritatively through Your Word. Give me a hungry heart and a passion to know You better by bathing myself in Your Holy Word. AMEN!